It was a cold February day when John and Nettie (Bowman) Alexander added a third child to their family. During the early years to follow, life was average for a child about to grow up during the great depression years. The location was Flint, Michigan, a General Motors town where the economy depended on car sales. There were good years and some not so good. Since most people barely held on to their homes and spent little on extras, the rich and the poor were not far apart in their way of living. Doug grew up believing he could reach goals that included a college education. Likely his attitude was influenced by Aunt Ethel Bowman, a high school teacher and her brother, Isiah Bowman, president of Johns Hopkins University. During high school, Doug took college prep courses, finishing in the upper fourth of his class. World War II came along and he joined the Navy medical corps, spending two of his three years in the South Pacific. He had met Ann Hultin at the start of his senior year and became engaged to her while on leave. After his discharge, they were married on 6/22/46, and as pledged, lasted “till death do us part” sixty-three years later. They attended MSU together and began a family while in college and in the years to follow, three boys and one girl. Doug taught in Albion for two years, then moved to Leslie where he became their first full time elementary principal. While there, he finished a master’s degree in school administration and saw the school grow in numbers and quality. He moved to Holt in 1958 to become the first junior high school principal and with the help of some great teachers, led the program to become one of the best programs in the area. During those fourteen years, he served a year as president of Region 8 of the MEA and was a charter member of the township planning commission. 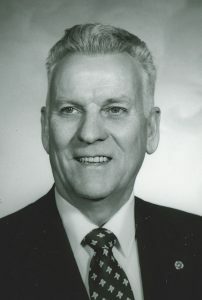 He joined the local Kiwanis club, served as its president in 1967 and later moved into a district leadership position. Doug served the Presbyterian Church for two terms as an elder at a time when growth and building took place. It was his second career as secretary/treasurer of the Michigan District of Kiwanis that he displayed his best leadership skills. The district grew by about 12% as did the numbers of clubs. For his efforts, he retired with the title Emeritus and was named an honorary member of The Council of Past Governors with all rights and privileges. His travels took him to 47 of the 50 states and to 19 foreign countries. Pretty good for a depression kid! Later, he served on a World Service project with a gathering of friends that raised a million and a half dollars. Doug was preceded in death by all members of his generation in both the Alexander and Hultin families, as well as ex-daughter-in-law, Carol. His survivors include: sons, Randy (Sandra), Gary and Mark, plus daughter, Kathy. Four grandsons, Zack (Stephanie), Erik (Anne), Craig and Jacob. Three great-grandchildren, Isaac, Ian and Ingrid; plus, ex-daughters-in-law, Jane. A memorial service will be held at 11:30 a.m. Saturday, May 4, 2019, at First Presbyterian Church of Holt, 2021 N. Aurelius Rd. His family will receive friends at the church beginning at 11:00 a.m. In lieu of flowers, memorial contributions may be made to Kiwanis of Michigan Foundation, or to First Presbyterian Church of Holt. To Kathy and the Alexander family, my deepest condolences to all of you. What a full and busy life he led and he touched so many lives. And we are grateful that he made Kiwanis a big part of his life, also! I remember your dad as a rather quiet fellow around your house, always polite and respectful of your mom and had an air of quiet intellect. He usually had a serious expression on his face when I came to visit Gary and he answered the door, but had a discrete smile that was warm. I moved to Holt in my 2nd year in High School, so never experience him as a Jr. Hi. principal, though Gary often spoke of him with respect for what he did. My mother passed in 2007 and my dad in 2014 and loosing your parents is like a new door opening for you, with your older cousins beginning to pass and has you wondering when your time will come. I have my share of medical and mobility issues these days, but would love to see, or talk or e-mail with particularly Gary, as time and interest permits. I live back in East Lansing these days, after 40 years in Holt, after College graduation.